I am passionate about eating delicious food and living an environmentally sustainable lifestyle. One of the ways I reduce my carbon footprint is by eating a predominately plant based diet and growing my own produce. I share my passions for sustainable living and food through my images in my series Sustain. My husband and I grow fruits and vegetables in containers and a 4’ wide by 50’ raised beds at our small urban lot around our home. We grow much more food than we can consume at the time of harvest, so we preserve it with canning, freezing and drying and eat it through the fall and winter. Growing our own food eliminates the carbon emissions associated with the transit of produce. The vegetables we grow are much more delicious that what can be purchased at the local grocer because we can allow the fruits and vegetables to ripen on the plants. We use non-toxic and organic growing methods. This form of agriculture is beneficial for the pollinator insects and soil enhancing organisms. Since there are no pesticides or waxes on the food, there is no need to peel vegetables, which increases the nutritional value of the food we eat. The experience connecting with the earth through gardening is so calming, meditative and provides a deep sense of satisfaction. 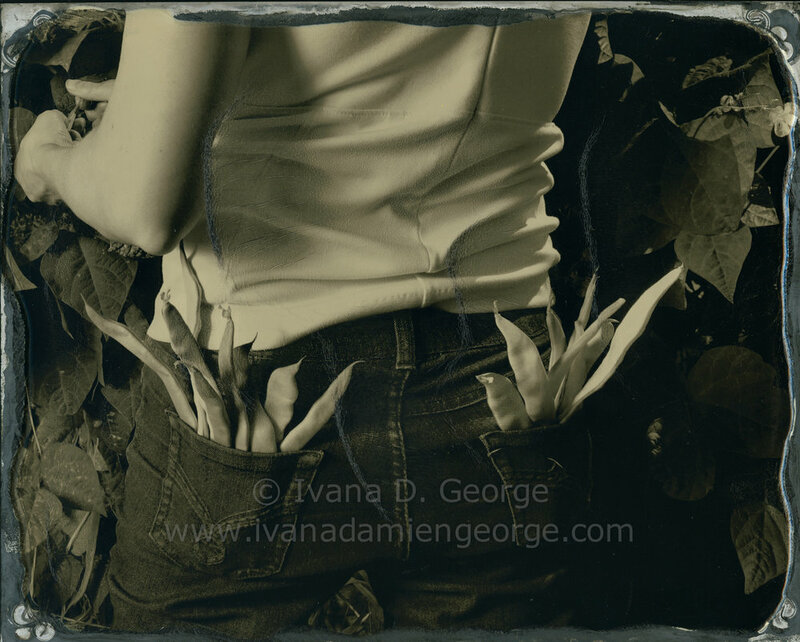 My color images deliver a sense of immediacy and sensual expression of the food I grow. Backyard organic vegetable gardening is something that anyone can do right now to reduce your carbon footprint and increase your health by eating more fresh, nutritious organic produce. The color combined with my use lighting, framing and posing to creatively expresses the beauty, unique variety and deliciousness of the fruits and vegetables that can be grown in a small urban space. The 30+ photographs in this collection are available as limited edition archival pigment ink prints on 100% reclaimed content cotton paper. To connect the themes in my project to the history of American vegetable gardening, especially the WWII era victory gardens, where Americans grew 60% of their produce during the war, I create prints with a vintage aesthetic. I want to evoke a sense of nostalgia for a time when more people grew food in the backyard and community gardens. I innovated a technique using mixed media and digital photography image transfer on aluminum to create these unique artworks in warm tones that recall the historic tintype process. Subtle inclusions of the contemporary urban environment connect us from our past to our present and the artworks highlight a means to a more sustainable future. The artworks are protected with a glossy archival ultraviolet light blocking spray. Additionally, I use an analog 8" x 10" camera to record in exquisite detail the gorgeous textures of the fruits and vegetables. Baroque inspired lighting glistens off the dewdrops on the freshly harvested produce. These prints are limited edition handmade cyanotypes on 100% cotton paper. The serene blue color palette conjures the inner peace I experience through connecting with the life giving capacities of the earth, through cultivation and care of my plants. To learn more about my creative process, check out the videos and essays on my blog! I hope that my images will connect with you in appreciating the beauty, sensual experience and environmental benefits of eating home-grown and locally grown food.